» Are my items in stock? » What if the item I want is out of stock? » What about back orders? » Is it safe to use my credit card? » Where can I enter a coupon code? » How do I place an international order? » Where is my email confirmation? » How much do you charge for shipping? » When will my order be charged? » How long does shipping take? » Do you offer expedited shipment for orders? » How do I track my order? » What is the return policy? » How do I return something? » Do I have to pay for the return postage? » When will my return be processed yet? » What about my privacy? We're confident that your Upbra® bra will fit great and make you feel amazing, or we'll make it right. If the size you receive does not work out for you, we are always here to help; included in all domestic orders is a prepaid return label for your return until you get the right size. Make sure the center cleavage control straps are unhooked and bra/swim straps are included for all returns or you will be charged for a restocking fee for damage, missing parts, or signs of wear. For refunds, it will be issued back to the original credit card. Initial shipping charges are non-refundable. Please allow 3 business days for us to process and ship out exchange(s), and 10 business days for a refund to process through from the date in which it is received. Items marked as Seconds/Slightly Imperfect Upbra® bras are not eligible for a refund. For More information, click here. We are doing our best to manufacture Upbra bras & swim tops as quickly as possible. Generally, if you order an item on our web page, it should be in stock as long as it states it is in stock. If an item is not in stock it will indicate that on our web page. If you order an out-of-stock item, we will email you the expected ship date. There is never an extra charge for shipping of back-ordered items. After your order ships, you will be notified by email. If the item you are interested in purchasing is out of stock, you can still select the size in the drop down menu. You will then be prompted with a link that states, "Click here to get an email when it's in stock!". Just click on that link and follow the instructions to fill out your information. As soon as that item is back in stock, you will be notified by email. We will email you if an item is back ordered. We ship back orders as soon as they are back in stock. We will email you when we ship any back ordered item. If an item you order has been on back order for an unusually long time, once the item is back in stock, we will contact you via email. We accept Visa, MasterCard, Amex, Discover and PayPal. You may also place your order by printing our order form and mailing it to us with a check or money order enclosed. Please be aware that orders placed with personal checks require an additional two weeks to process. For your security, please do not send cash. Yes, shopping at Upbra.com is safe. Our secure server software encrypts information, ensuring that Internet transactions stay private and protected. We use Secure Sockets Layer (SSL) technology, considered the gold standard in Internet encryption technology, to protect the security of your credit card information as it is transmitted to us. You may also place your order by emailing us at office@upbra.net or printing our order form and mailing it to us. Occasionally we offer coupon or promotional codes to our customers. To use one of these codes, please enter the code on the “Payment” page of our checkout process. If you place your order over the phone, please inform the customer service agent that you have a code. Only one coupon code may be used per order. 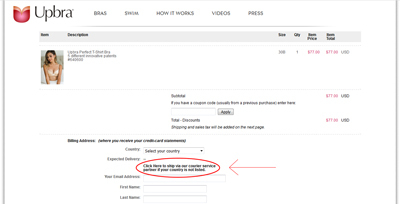 For most countries, your flag should show up automatically*, or you can select it on the shopping pages during the purchase process. When your flag is selected, you will be billed and shipped to via the UPS i-Parcel courier service from UPS. If your flag does not show up, and it is not available for selection during the purchase process, don't worry, we will ship to your country via the DHL courier service, and you will be billed by and shipped to via DHL through its Global Checkout system. Both services are extremely fast and reliable. Most shipments arrive in 9-18 business days after initial purchase date. Orders to Norway are shipped via the U.S. postal system. You will receive your email confirmation within 24 hours of placing your order. We ship via USPS Mail. Postage for standard shipping is $8.95 flat rate. partner if your country is not listed." during checkout. Australia 17.12 -- AUD Select your country's flag on the "Add to Bag" page. Austria 31.08 37.62 EURO Select your country's flag on the "Add to Bag" page. Belgium 28.62 34.34 EURO Select your country's flag on the "Add to Bag" page. Brazil 117.05 211.35 BRL Select your country's flag on the "Add to Bag" page. Canada 12.78 11.5 CAD Select your country's flag on the "Add to Bag" page. China 214.73 -- CNY Select your country's flag on the "Add to Bag" page. Costa Rica 14804.79 15943.62 CRC Select your country's flag on the "Add to Bag" page. Czech Republic 24484.84 42706.13 CZK Select your country's flag on the "Add to Bag" page. Denmark 122.21 146.09 DKK Select your country's flag on the "Add to Bag" page. Finland 33.52 26.16 EURO Select your country's flag on the "Add to Bag" page. France 16.4 19.62 EURO Select your country's flag on the "Add to Bag" page. Germany 13.94 19.62 EURO Select your country's flag on the "Add to Bag" page. Greece 13.90 19.62 EURO Select your country's flag on the "Add to Bag" page. Hong Kong 101.61 -- HKD Select your country's flag on the "Add to Bag" page. Hungary 4366.15 7447.49 HUF Select your country's flag on the "Add to Bag" page. India 2012.61 2272.30 INR Select your country's flag on the "Add to Bag" page. Indonesia 195132 657576 IDR Select your country's flag on the "Add to Bag" page. Ireland 9.83 17.98 EURO Select your country's flag on the "Add to Bag" page. Isle of Man 11.44 13.08 EURO Select your country's flag on the "Add to Bag" page. Israel 114.82 69.59 ILS Select your country's flag on the "Add to Bag" page. Italy 27.79 20.44 EURO Select your country's flag on the "Add to Bag" page. Japan 1531.57 -- JPY Select your country's flag on the "Add to Bag" page. Korea, Republic of 15154.44 -- KRW Select your country's flag on the "Add to Bag" page. Latvia 26.16 20.44 EURO Select your country's flag on the "Add to Bag" page. Liechtenstein 16.9 6.57 CHF Select your country's flag on the "Add to Bag" page. Lithuania 25.34 18.8 EURO Select your country's flag on the "Add to Bag" page. Luxembourg 27.79 13.9 EURO Select your country's flag on the "Add to Bag" page. Malaysia 66.43 19.54 MYR Select your country's flag on the "Add to Bag" page. Mexico 262.84 244.94 MXN Select your country's flag on the "Add to Bag" page. Monaco 21.26 17.17 EURO Select your country's flag on the "Add to Bag" page. Netherlands 31.88 53.96 EURO Select your country's flag on the "Add to Bag" page. New Zealand 18.32 91.2 NZD Select your country's flag on the "Add to Bag" page. Poland 71.63 88.69 PLN Select your country's flag on the "Add to Bag" page. Portugal 13.08 17.98 EURO Select your country's flag on the "Add to Bag" page. Saudi Arabia 63.57 30 SAR Select your country's flag on the "Add to Bag" page. Singapore 15.88 -- SGD Select your country's flag on the "Add to Bag" page. Slovakia 53.94 17.98 EURO Select your country's flag on the "Add to Bag" page. Slovania 26.15 18.8 EURO Select your country's flag on the "Add to Bag" page. South Africa 292.97 632.83 ZAR Select your country's flag on the "Add to Bag" page. Spain 9.83 17.98 EURO Select your country's flag on the "Add to Bag" page. Sweden 337.25 501.77 SEK Select your country's flag on the "Add to Bag" page. Switzerland 12.74 6.57 CHF Select your country's flag on the "Add to Bag" page. Taiwan 527.26 -- TWD Select your country's flag on the "Add to Bag" page. Thailand 755.53 2298.08 THB Select your country's flag on the "Add to Bag" page. Turkey 80.12 61.05 TRY Select your country's flag on the "Add to Bag" page. United Arab Emirates 62.26 -- AED Select your country's flag on the "Add to Bag" page. United Kingdom 7.86 15.82 GBP Select your country's flag on the "Add to Bag" page. For credit card orders, will be charged within 48 hours. For PayPal orders you are charged by PayPal when the order is placed. Most in-stock orders are shipped out 2 business days after purchase. During the holiday season, please allow 2-4 business days for your order to process. Upbra bras & swim are new products and due to the unexpected demand, stock is still limited. Most shipments arrive within 5-8 business days. We ship from our facility to you via USPS (United States Postal Service). We ship from our facility to you within 2 business days via USPS (United States Postal Service). Once your order ships, you will receive a tracking email. Please allow 4-6 days for your tracking to update when your package leaves their facility. We ship from our facility to UPS i-Parcel's export facility within 2 business days. Once UPS i-Parcel receives it, they will ship directly to you. Please allow 4-6 days for your tracking to update when your package leaves their facility. We ship from our facility to Global Checkout's facility within 2 business days. Once Global Checkout receives it, they will ship directly to you. Do you offer expedited shipment for orders? Unfortunately, we do not offer expedited shipments. However, our shipping time is quite fast; domestic orders typically only take 3-5 days for delivery. We will notify you via email after your package has shipped. Packages usually ship the next business day. To ensure that you do get your shipping confirmation email, please save the email address office@upbra.net to your address book so that your email will go to your inbox and not your spam folder. A cookie is a small piece of information that web sites use to remember information about users. We use transient cookies to provide continuity from page to page. They do not contain any personally identifying information.